To say that longleaf pine forests are a focus for conservation in the Southeast is like saying the University of Alabama has a good football team. It’s beyond understatement. But efforts to restore the forest types that once covered more than 90 million acres from Virginia to Texas recently gained more ground in Georgia. The Longleaf Stewardship Fund announced nearly $3 million in grants for work in seven states last month. The Georgia Wildlife Resources Division and partners will receive $493,250 in two grants for work varying from planting longleaf to conducting prescribed burns. Matt Elliott, a Nongame Conservation Section program manager with the Wildlife Resources Division, is helping manage these and nearly $2 million in State Wildlife Grants for restoring sandhill habitats across five states. Those habitats include longleaf pine/turkey oak communities. 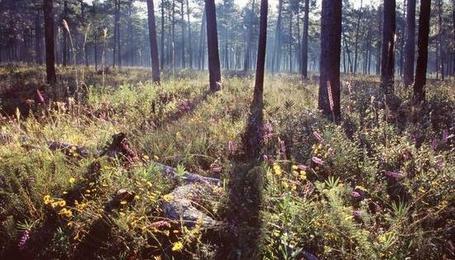 Today’s longleaf forests are a thin shadow of what the first Europeans settlers saw. Development, agriculture, fire suppression – all ravaged ancient ecosystems that thrived on regular fires. Longleaf is found on less than 4 percent of its historic range, an area that included more than half of Georgia. The Longleaf Stewardship Fund is one of the organizations bent on restoring longleaf ecosystems and their diverse animal and plant life, from wiregrass to rare eastern indigo snakes. The National Fish and Wildlife Foundation established the public-private effort, branching off the foundation’s Longleaf Legacy Program with Southern Co. The fund features heavy hitters such as the Atlanta-based company, the Defense Department and the U.S. Fish and Wildlife Service. Team with the military, Georgia Land Trust and the Longleaf Alliance to plant 1,350 acres of longleaf and conduct prescribed burns on 5,000 acres in the Altamaha River corridor and near Fort Stewart. America’s Longleaf Restoration Initiative has designated the target site a Significant Geographic Area. The work will help create corridors for rare wildlife such as endangered red-cockaded woodpeckers “isolated” on the base. Another $282,000 will go to other agencies and groups such as the National Wild Turkey Federation and Joseph W. Jones Ecological Research Center near Newton, Ga., for multistate research and outreach that includes Georgia. But the universe of longleaf restoration is even broader. Powered by State Wildlife Grants and matching efforts and money, the Nongame Conservation Section and its partners have already treated 15,200 acres of sandhills with prescribed fire, planted 3,500 acres of longleaf and removed non-native sand pines on hundreds of acres. 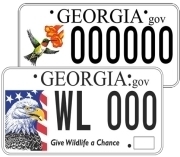 Related work targets wildlife. The Farm Bill’s Working Lands for Wildlife program is aimed at improving habitat for gopher tortoises, a keystone species in longleaf ecosystems. The Fish and Wildlife Service has paired with Georgia, Florida and other states to keep gophers off the endangered species list in the eastern part of the tortoise’s range (“Feds, states team to keep tortoises unlisted,” Sept. 12). With more than 90 percent of the state in private ownership, private landowners play a central role in longleaf restoration. One of those landowners is Reese Thompson of Vidalia, a sixth-generation tree farmer and former state Board of Natural Resources member. Three years ago, Thompson decided to stop planting slash pine – the backbone of the turpentine industry – and focus on planting longleaf. He has enrolled some of his family’s property in Telfair and Wheeler counties in Working Lands for Wildlife, conducted controlled burns with the Orianne Society and, as part of one of the Longleaf Stewardship Fund grants, will sow native groundcover in newly planted longleaf areas next year. One longleaf habitat type that usually draws less attention will be center stage at next week’s Georgia Plant Conservation Alliance meeting. The fall session of the alliance will focus on montane longleaf and associated rare plant communities. A symposium is set for Oct. 18 at F.D. Roosevelt State Park in Pine Mountain, part of a ridge with montane longleaf that extends to Thompson. Formed in 1995, the Georgia Plant Conservation Alliance is a network of public gardens, government agencies and environmental groups focused on preserving Georgia’s rare flora. 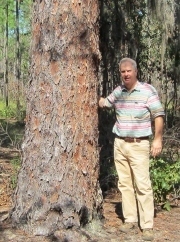 Longleaf restoration has roots in Georgia. Work by the DNR, much of it focused on birds, has been going on for years on southwest Georgia wildlife management areas such as Chickasawhatchee near Albany. Recently I took a ride down memory lane. It’s a journey I take quite often from spring through fall. When I embark on these trips I don't venture out on a busy highway or even a dusty country road. I don’t crank up my car or old faded red pickup, or even go beyond the confines of my yard. Join Terry for this wildlife-oriented trip down memory lane. 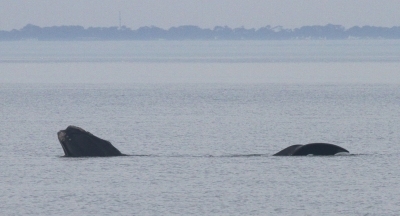 With North Atlantic right whales returning to Georgia’s coast soon, the latest issue of “Right Whale News” hints at what might be expected with its lead article, “Bay of Fundy field season 2012: Warm water and few whales.” Also read more right whale updates in this blog. In the continuing saga of State Wildlife Grants, a Senate interior and environmental appropriations draft bill for fiscal 2013 sets funding at $61 million. That’s the same amount as this year, but a significant improvement over the 50 percent funding cut and hike in required grant matches the House Appropriations Committee approved. The Senate draft came on the heels of a Teaming with Wildlife campaign that resulted in more than 600 organizations encouraging the Senate Interior Appropriations subcommittee to deal equitably with State and Tribal Wildlife Grants in federal budget considerations. The program provides critical support to help states conserve at-risk wildlife. For women interested in the outdoors, Becoming an Outdoors-Woman offers a chance to learn or hone skills in sessions led by pros and suited novices and veterans. A DNR "basic" BOW workshop is set for Nov. 2-4 at Charlie Elliott Wildlife Center near Mansfield. A long-term salt marsh monitoring project initiated by Nongame Conservation Section staff will examine vegetation changes and environmental factors where the coastal marsh meets uplands. The nine sites picked range from Crooked River State Park to Cabbage Island. The 18th annual CoastFest drew a crowd topping 8,000 to DNR Coastal Regional Headquarters in Brunswick Oct. 6. 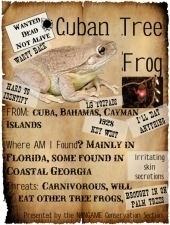 Exhibits included Nongame Conservation Section’s display on invasive species “wanted dead, not alive” (left). Nongame Program Manager Jason Lee also picked a winner for best endangered species art (see "Parting shots" below). Outdoor Adventure Days on Sept. 22 attracted more than 4,000 children and adults to Wildlife Resources Division sites. The fun varied from fishing and archery to snake shows, shooting simulators and K-9 demonstrations. A bald eagle found dead last month in the parking lot of a Bulloch County school apparently died of natural causes, according to a DNR investigation. Although no longer on the endangered species list, bald eagles are protected by federal and state law. Mountain lions are making headlines in Iowa, Wisconsin, Nebraska – where more frequent sightings included a recent road kill – and California, where a new study points to Nevada as the source of cougars moving into the Sierra Nevada and the Golden State. Oct. 18-19: Georgia Plant Conservation Alliance fall meeting, F.D. Roosevelt State Park, Pine Mountain. October-November: Bird-banding opportunities for volunteers organized by Georgia Important Bird Areas Coordinator Charlie Muise include: Joe Kurz WMA – 7 a.m. Oct. 19, 7:10 a.m. Oct. 28, 7:15 a.m. Nov. 2 and (tentatively) 6:30 a.m. Nov. 16; Panola Mountain State Park – 6:45 a.m. Oct. 20, 6:50 a.m. Oct. 27, 6 a.m. Nov. 10 and 6:15 a.m. Nov. 25. Details: Email Charlie Muise. 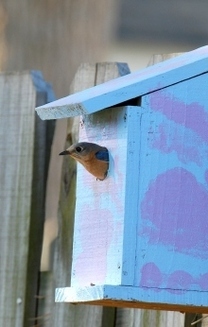 Oct. 20: Open house 10 a.m.-2 p.m. at Joseph W. Jones Ecological Research Center, Newton. 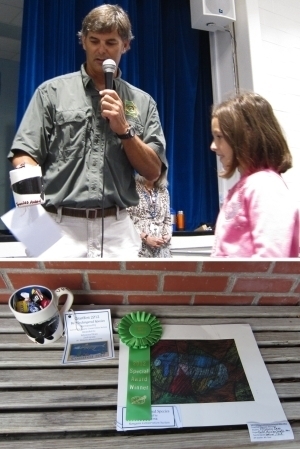 sponsored a Best Endangered Species art award. at the St. Simons Island school. "Giant mysterious eyeball found on Florida beach," National Geographic. And the follow-up: "‘Mystery eyeball’ appears to be from swordfish," Florida Fish and Wildlife Conservation Commission.